In 2009 I discovered that J.R.R. Tolkien was stationed near Penkridge, Staffordshire, during the Great War. As a young army officer Tolkien was billeted on Cannock Chase where he wrote poetry, including some of the first in his created elvish languages. He returned to convalesce in Great Haywood, Staffordshire after contracting trench fever during the Battle of the Somme and it was then that he first put into prose some of his mythological stories – The Fall of Gondolin and The Cottage of Lost Play. These stories would later appear in the posthumously published Book of Lost Tales, but were critical in his development of what became Middle-earth and the more familiar stories of The Hobbit and The Lord of the Rings. In 2012 I met David Robbie, local historian and member of the Haywood Society – a small group concerned with promoting the heritage of that area. We collaborated on the Staffordshire Tolkien Trail – a colourful guidebook, detailing the history of Tolkien’s connections with Staffordshire, maps with suggested walking routes to visit these locations and a detailed chronology of Tolkien’s time in the county. As the centenary of the Great War approached and Staffordshire County Council looked to support and coordinate efforts in the county, we began to consider the idea of a touring exhibition. 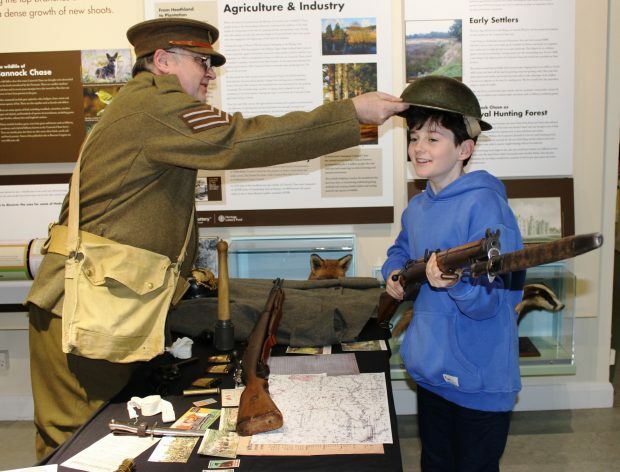 We developed the Heritage Lottery Fund application in 2015 with Staffordshire Library and Arts and the Museum of Cannock Chase offering ‘support in kind’ to the application. The bid was successful and funds were made available for a March 2016 launch. The initial tour plan had 9 main locations around Cannock Chase. We expanded this in response to demand. There are now, 22 venues confirmed until the end of 2018. To encourage volunteer engagement we used press releases, posters and social media locally and from amongst existing library and museum volunteers. We also used the University of Leicester’s free advertising facility to engage those with a professional interest. We worked with a graphic designer who was able to transform the content we created to create an attractive colour/design palette which would be used across the banners, promotional materials and posters to offer consistency and a professional appearance. Logos and acknowledgements of partners were agreed and their positioning on all template promotional material and exhibition contents was standardised. Use of images was critical to our plan for a highly visual exhibition and permissions to use photographs, art work, quotes and book covers were sought. Many images were free to use, or available for a fee, so long as permission was sought and proper referencing guidelines followed to ensure copyright was respected. We sourced from the Imperial War Museum, HarperCollins Publishers, and National Archives. The Tolkien Estate kindly allowed use of several photographs and original sketches made by Tolkien while in Staffordshire that were essential to the exhibition. To maintain consistency I supplied each venue and our communications team with a package of materials for use in their own local publicity. This included generic press releases, images, logos, empty belly style posters/flyers, an exhibition guide and social media guidelines. We decided to use the hashtag phrase #Tolkien in #Staffordshire on all social media and link to accounts that might retweet to followers. To keep the social media fresh opportunities for new photographic images or news stories were taken to evidence engagement. This often included anecdotal/fun images such as of the Tolkien mannequin being carried into a venue, the exhibition mid-assembly or the arrival of the original Tolkien sketches from the Bodleian Library. 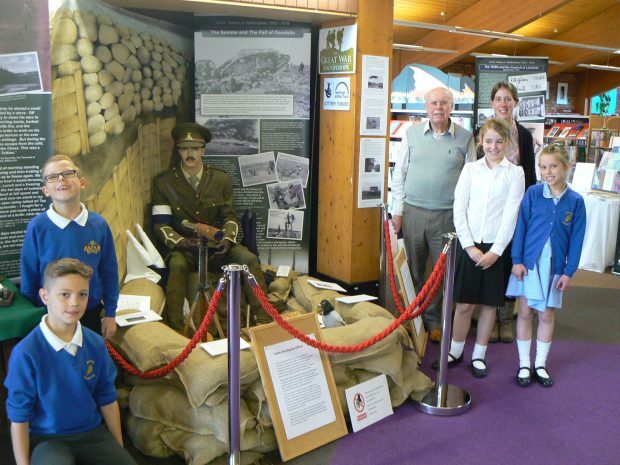 We also linked with www.staffordshiregreatwar.com to promote the exhibition tour, events and additional information and news stories. The site will be archived with the British Library digital archive, thus preserving the contents as part of the legacy of the project. The social media response has been huge and the exhibition has generated some of Staffordshire Libraries’ top Facebook and Twitter posts. 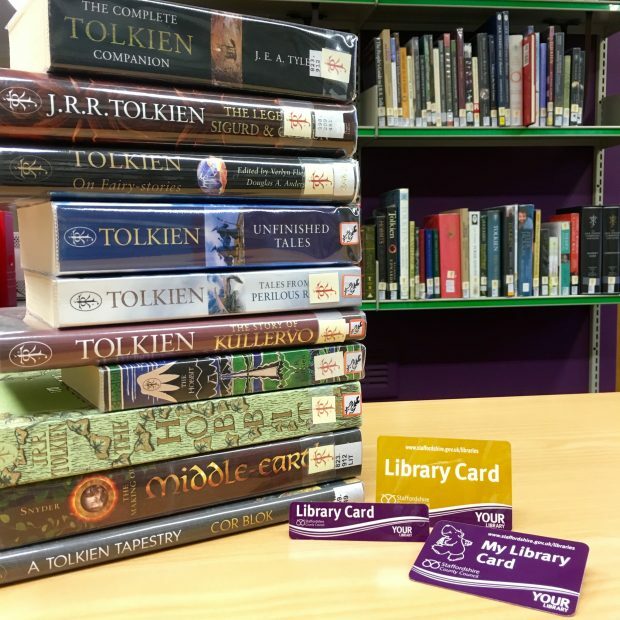 A search of #Tolkien in #Staffordshire on Twitter gives an example of the extent of engagement. 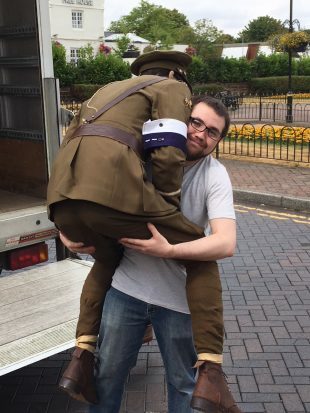 working with Imagineer Productions’ Arts Council funded project in Staffordshire called War Bride, linking with the war time experience of Edith Tolkien. We have raised the profile of the ‘Tolkien in Staffordshire’ story by hosting visits from important Tolkien scholars, Professor Nils Ivar Agoy, Magne Bergland, John Garth, (Tolkien’s biographer of the Great War period) and Michael Flowers, (researcher into Tolkien’s time in Yorkshire in 1917). David has also spoken at seminars and conferences in the UK and Germany demonstrating the interest in this project. The tour continues, with venues already contacting us for 2019, including the Tolkien Society Conference in Birmingham in August 2019. In addition we are beginning to explore partnership opportunities with Birmingham Museums to link with the better known Tolkien site: Sarehole Mill. To keep up to date with activities in Staffordshire libraries, follow them on twitter, facebook, or take a look at their webpages. Great article Scott. Really informative and good to see some solid outcomes from this piece of work.